Last weekend, January 25-27, 2019, a force descended upon the Chicago O’Hare airport. And we’re not talking about the Polar Vortex. 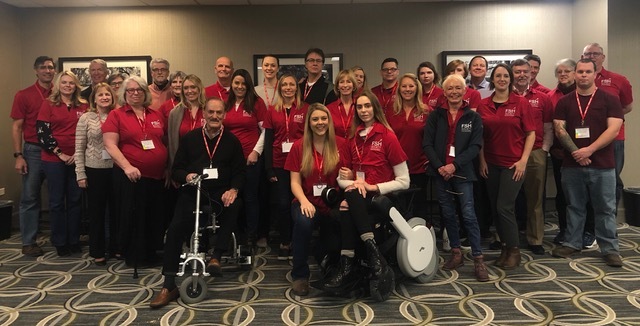 Twenty-nine chapter directors and Walk & Roll leaders convened for the FSH Society’s inaugural volunteer leadership summit for two days of intensive learning, sharing, and networking – all to train them to become effective, impactful leaders within their local communities. The weekend’s agenda included sessions on the history and evolution of the FSH Society and our mission, working with volunteers and different communication styles, local patient advocacy, hosting educational and support meetings, and fundraising – just to name a few topics. And while we were all there to learn, the most powerful part of the meeting was in the relationships that were formed among the leaders who attended. Everyone has the same goal, which is to bring hearts and hands closer to the FSHD families we serve. Educating, empowering, and activating our communities across the nation–and the world–is essential to achieving our mission to improve the lives of patients and accelerating the development of treatments and a cure. Together, we are an unstoppable force! Do you want to join our nationwide volunteer leadership team? Learn more HERE. Questions? Contact Beth Johnston, our Chief Community Development Officer. Keep an eye on our Event Calendar for upcoming local meetings fundraisers in your area. What an awesome weekend! What an amazing group! Here we go… let’s change the world, people.